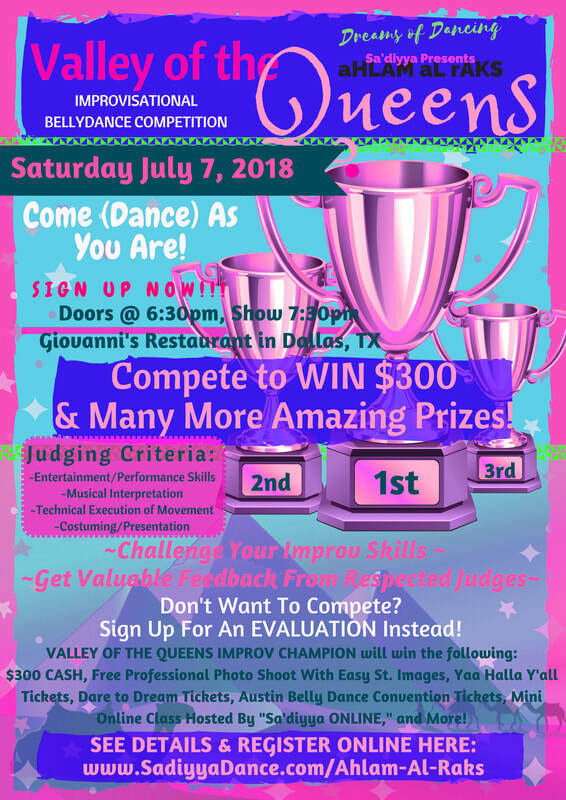 The evening of Saturday July 7, 2018 will start off with a fabulous dinner provided by Giovanni's Restaurant, followed by the Judges' Showcase and the "Valley of the Queens" Improvisational Bellydance Competition. And then the second act of the show will be the Gala Event showcasing talented local and regional belly dancers, soloists and troupes! The "Valley of the Queens" Improvisational Bellydance Competition will feature our brave competitors who will be taking the challenge of dancing improvisationaly to music they won't know until they hit the stage! The competition is open to any style of belly dance. ​And for dancers who don't want to compete but would also like to receive valuable feedback about their improvised performances, evaluations will be available to dancers who preregister for them. See more information below about the competition guidelines, judging criteria, prizes and more! PLEASE NOTE: The prices above are for the audience. Gala Show performers do not pay to perform & competitors pay a registration fee to either compete or receive an evaluation. ​Top prize is $300 and MORE! Receive valuable feedback from Cassandra Fox, Sa'diyya, Vashti & Isis! Want to donate a prize? Contact Sa'diyya! -Mini Online Class Hosted By "Sa'diyya ONLINE"
This is a unique Bellydance competition and was the first of its kind in Dallas! Sa'diyya, a multiple award winning belly dancer, is the producer of this competition that is meant to be a fun, supportive and nurturing environment for dancers looking to challenge themselves and grow from the experience. Contestants will receive constructive written feedback that they can apply to their dance training. This contest is meant for any advanced/professional dancer of any Bellydance style. And for dancers who don't want to compete but would like to receive valuable feedback about their improvised performances, evaluations will be available to dancers who preregister for them. ​Dancers will know the song list ahead of time (see below), but the actual songs won't be revealed until the dancers step on stage, making it a true improv challenge. ​-Any style of bellydance is accepted, although the music selections are more classical in nature. -Contestants do not have to buy a show ticket but if they would like to purchase dinner, they may at a discounted rate of $15. -Contestants are not required to take any workshops, although it is encouraged, especially the "Improving Improvisation" workshop with Cassandra Fox! -Contestants will receive more detailed information in an electronic packet after registration. This will include things like the stage dimensions, arrival time, etc. 1) Pre-register to be a contestant. There is a $75 registration fee that must be prepaid in order to reserve a spot in the competition lineup. Register HERE. 2) Review the list of possible songs below and be familiar with all of them. Contestants will not know the song she/he will be performing to until they step on stage! 3) Invite your family and friends so they can vote for their CROWD FAVORITE contestant! 4) On the night of the competition, contestants will draw numbers to determine the order of the performances. 5) Each contestant will perform to some of the songs listed below. 6) The awards will be announced at the end after the Gala Show portion of the evening. 7) Contestants will be given the score sheets and written feedback immediately following the conclusion of the contest on the same evening. Don't want to compete? But want to still receive valuable feedback from the judges? Register to receive an evaluation instead! Contestants are going to be judged for their individual performance rather than compared to each other. Cassandra Fox is a belly dance and Caribbean fusion dance instructor and performer from Coldwater, Ontario, Canada. She started dancing in 2008 and since then has been committed to developing her skills and art, and has had the privilege to learn from various workshop instructors . Largely known for her powerful shimmies, free spirited performances, strong technique, and the emotion and personality that she exudes while performing and teaching she has become a sought after performer and instructor both locally and in the international dance community. Cassandra has considerable competition experience, having competed from 2010 until 2014 in various competitions, highlights include multiple top 4 finishes at Belly Dancer of the Universe in Long Beach California including winning Champion in the fusion category in 2012, and the People's Choice Award from Drum Solo in 2014. She has also helped to keep the stereotype of the "Nice Canadian" alive having won multiple congeniality awards. She is perhaps most well known for her Caribbean Fusion style which pulls on her Caribbean heritage (Her family is originally from Jamaica) which fuses Caribbean music and movement with elements of belly dance movement and musicality. She has been fortunate to have a strong social media following and presence, with over 75,000 subscribers on YouTube, over 196,000 followers on Instagram and over 500,000 followers on Facebook, and multiple viral videos, the most notable of which has over 19 million views on Facebook. Having such a presence online has helped to develop helpful techniques for dealing with "hate", how to determine hate from criticism, and how to tune out "the noise" and focus on your art and work. This presence has also allowed her to connect with many people and has presented multiple opportunities to perform and teach throughout the US since 2011. Her experience has motivated her to share the love of dance, music, and culture with others and inspire them to want to have fun while, working hard and learning. Cassandra strives for a fun and focused learning environment while teaching, and an engaging and genuine experience while performing. Vashti's great love of Oriental Dance began in the early 1970s, and continues to grow as each year passes. Vashti has been teaching in Dallas since 1976, and currently teaches at You Can Dance Dallas. Over the years, she has also taught numerous workshops ans seminars locally, in numerous other cities in Texas and around the country including Houston, Austin, Lubbock, Oklahoma City, St. Louis, South Bend IN, Chicago, Las Vegas, Peducha KY and San Francisco. Vashti's performance credits include restaurants, clubs and private events locally, throughout Texas and the U.S. She was the featured dancer at the Lebanese Food Festival at Our Lady of Lebanon Catholic Church from its inception through 2012. Other venues include the Dallas Museum of Arts, the Dallas Opera, South Dallas Cultural Center, El Centro College, Brookhaven College, Richland College, The University of Dallas, UT Southwestern Medical School and The University Texas Austin, just to name a few. During her 40 plus years of study and training, Vashti has been influenced by a myriad of wonderful teachers and dancers. Those influences, combined with hours of practice and performance, have helped create her unique style of artistry and excitement. Sa'diyya is an internationally recognized belly dancer based in Dallas, TX. She has been involved in belly dance since 1996 and is an accomplished performer, instructor, choreographer, costume designer and event producer. ​Sa'diyya also travels nationally and internationally to teach and perform at belly dance events and festivals. Sa'diyya has been on a semi-hiatus for almost 2 years because of a long and wonderful journey of trying to become pregnant, getting pregnant and then having a sweet baby girl!